The original Sensei gaming mouse, which Steelseries called the “most customizable mouse in the world,” was the starting point for the SSR. After stripping it down and getting rid of the 32-bit ARM processor, ditching the LCD menu system, and onboard memory, the SSR was born. The SSR comes in either a glossy black or rubberized finish with a double braided sleeve over the USB cable. This review focuses on the rubber covered unit. It sports eight buttons (of which seven are programmable) and has a basic illumination scheme that can be turned off completely. 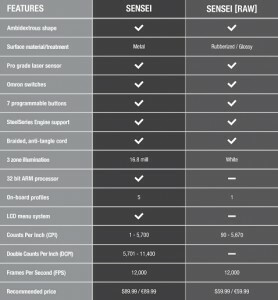 The chart below provides and an in-depth comparison of both versions of the Sensei. 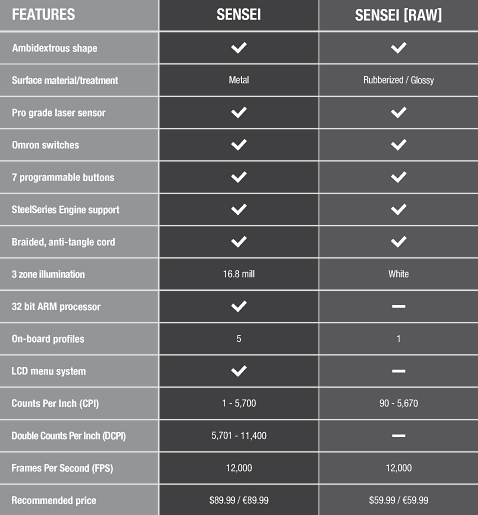 The SSR has all the specs you would expect to see associated with a gaming mouse. According to Steelseries, the SSR uses a pro grade laser sensor along with other tournament grade components, such as durable buttons and high performance glide pads, which can be replaced. 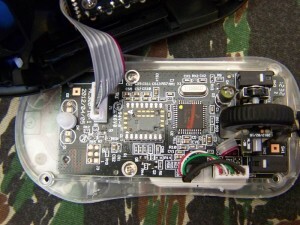 All of the internal components on the review unit were cleanly and firmly soldered to the printed circuit board. Dots-per-inch (DPI) settings range from a low of 90 DPI up to a maximum of 5,670 DPI for maximum accuracy. Like most quality gaming mice, the SSR can handle tracking movements of up to three point eight metres per second at thirty G’s before it will malfunction. 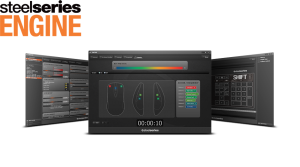 The SSR has (PC/MAC) driver software called the Steelseries Engine. 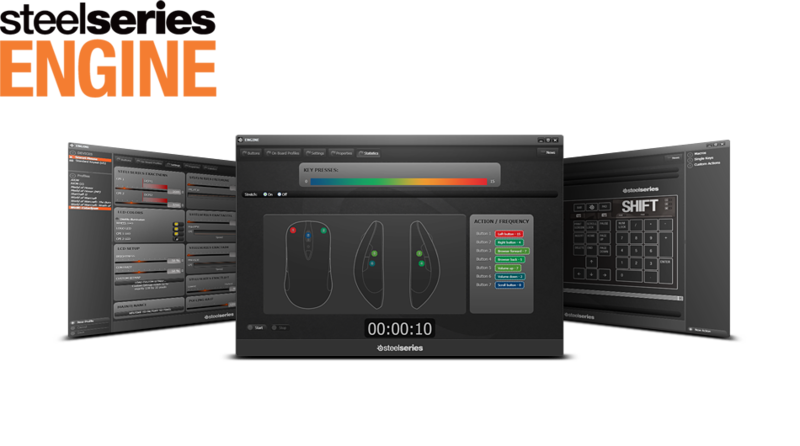 The Steelseries Engine can be accessed by clicking on a quick launch icon and will allow the gamer to create layered macros, change button customization, set counts per inch, the polling rate, and lighting adjustments. The software also allows gamers to compile statistics on button usage to create effective gaming profiles and calculate their actions-per-minute (APM). Like competing products, the SSR driver allows users to adjust DPI settings on the fly for maximum performance in dynamic gaming environments. Tracking was never a concern–no matter how fast I moved the mouse there was no lag or glitching. The braided cord was a bit stiff, but this was a minor quibble that had no impact on performance or game play. The SSR worked great in games like Battlefield, ARMA, and Call of Duty. After experimenting with various sensitivity settings in each game, I was running and gunning in no time. I mapped the buttons on the side of the mouse for special attacks, such as using the combat knife in COD or repetitive tasks, such as reloading. I used the SSR in strategy games like Harpoon Admiral’s Edition, Naval Warfare: Arctic Circle, Silent Storm, and the new X-COM without any problems. I found the SSR comfortable during long gaming sessions and appreciated the traction afforded by the rubber exterior. The SSR is a great gaming mouse, but it may not be the ideal choice for everyone. The traditional design and subdued appearance may put off some gamers searching for a futuristic looking mouse with a myriad of buttons, wild lighting effects, and user adjustments. Another common complaint will be that the SSR is a corded, not a wireless, unit. 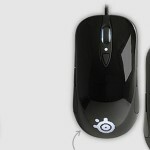 Steelseries is walking a tightrope when it comes to releasing this mouse in a highly competitive market crowded with very high profile units like the Razer Naga Logitech G300, Cyborg MMO 7 , or Corsair Vengeance M60. Regardless, they believe that there is a market for the SSR and I think they’re right. A top down view of the Sensei [RAW]. Note the buttons on the side of the mouse and the double braided USB cable. The SSR is an excellent mouse for gamers who shun flashy peripherals and are only concerned with high performance, quality construction, and value for their money. 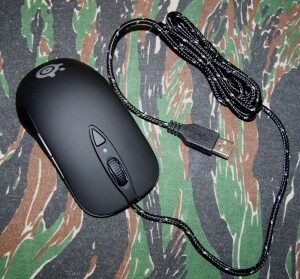 As Hans and Franz from the old Saturday Night Live skit “Pump It Up,” would say “Dis mouse is not for girlie men.” With fewer buttons, minimal lighting effects and a steathly black exterior, the SSR may not appear to be as impressive as a Razer or Logitech device, but don’t be fooled – this is a serious gaming mouse. 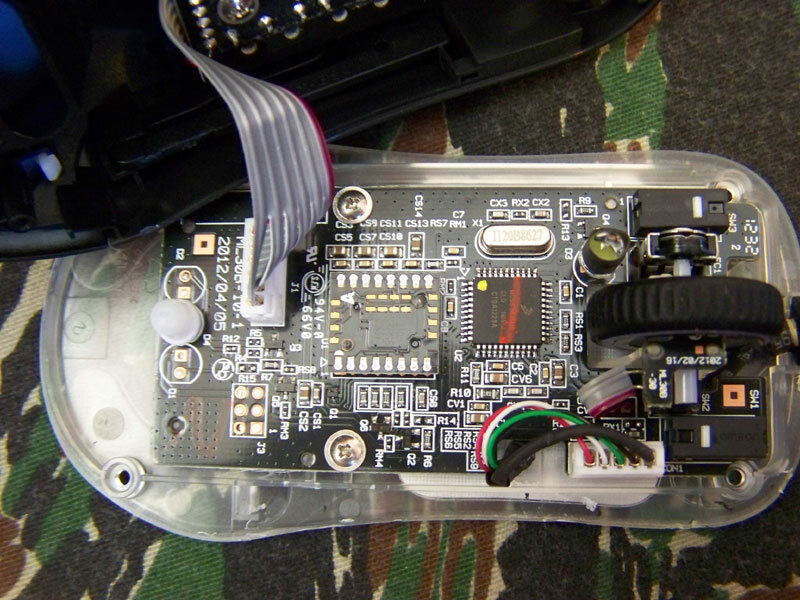 As mentioned above, this unit is the AK-47 of gaming mice, it is stripped down and practical, but on the PC battlefield it is a virtual killing machine. I’ve had all kinds of gaming mice and have owned this mouse for over a year now…I’ve done everything from competitive FPS gaming to productivity suite stuff such as outlook excel. Very very pleased with the mouse. It doesn’t look like some pimped out mouse with ridiculous amount of form over function, but has sleek look with high quality components. I might never go back to Logitech, razer, or microsoft. If you do not need weights, ten different types of blinking colored lights, or built-in fog machine; but need a reliable high performance mouse; this Sensei is for you Daniel-son.